Let’s get your grooves on point with the best sequencer software plugins for music production. We’ve honed down a giant collection of sequencers, and now present to you 5 of which we’re certain will make you happy. Quick answer: Sugar Bytes Thesys is top choice here, followed by Consequence by the same plugin makers. The cheapest ones are Inertia and Array, both by Sinevibes. The rest of this plugin guide will look at these plugins with a little more detail, so you know what you’re getting into before you get your next plugin. A sequencer is a tool that allows you to process sound via a series of steps or sequences. You can use this to make beats, grooves, melodic patterns, or shutter and sputter effects. Similar in concept to how MIDI and audio sequencers trigger events along a musical bar or measure in your DAW piano roll, sequencer effects plug-ins introduce different values at every step. This is where they become very useful, as they result in continually–and sometimes radically–evolving rhythmic phrases. With these particular sequencer plug-ins, effects such as filters, distortion units, and gate circuits are modulated on a step-by-step basis. This makes it possible to transform even the most static audio tracks into extremely gated and stuttering rhythmic patterns. You can read more about how they work from this Wikipedia article on audio sequencers. Features to Look for in a Sequencer Plug-in? … and you definitely want plenty of control over as many different parameters as possible. Some of the best tools can modulate effects and parameters to a very precise degree, letting you generate everything from subtly evolving washes of sound to massively glitched-out rhythms. When choosing a sequencer plug-in, you definitely want one that shapes your audio in ways that are subjectively pleasing to your ear, or at least is going to give you the result you want. Not all glitch effects are usable in the context of a mix, even though they may sound pretty impressive when soloed. In general, you want a sequencer plug-in that lets you get as extreme–or as subtle–as you want depending on the task at hand. 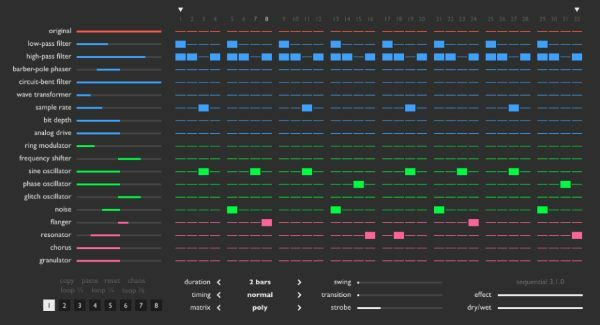 Sugar Bytes Thesys is an impressive 32-step sequencer. It has a number of essential music-creation and sound-mangling features. 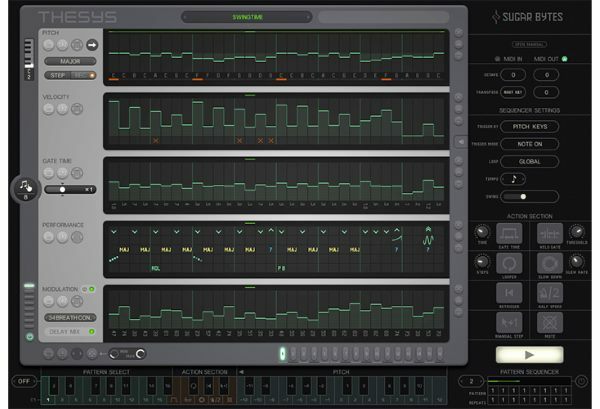 It’s ideally suited to real-time pattern manipulation, so it has a useful randomization feature and a built-in synthesizer that lets you generate fresh new ideas on the spot, or bring new life to tired old grooves. Users expecting to make use of Thesys’ arp functions were more than a little surprised at how much more capable it was than they thought. Although the plug-in is frequently used in studio settings, some users reported using it to great effect during live performances. Admittedly, some prep work is necessary in order to make full use of its capabilities in live settings. With a bit of preplanning however, Thesys can definitely enhance even the most mundane instrument parts. For the price, Sugar Bytes Thesys packs an almost unbelievable amount of value. Even if it were priced a couple of hundred dollars more, it would still be worth the cost given all the features and functionalities that you get in return. And with the ability to mutate your tracks beyond recognition, this is a sound tweaker’s dream come true. Sinevibes Array is billed as a “spectral animation” plug-in, a description that provides a mere hint of potentially awesome capabilities. Audio is treated in eight different bands, each of which can be filtered and/or muted in a most impressive manner. Whether you want a quick way to freak your loops or you want more detailed control over how your audio is chopped up and glitched, Array is a worthy addition to the collection of sound-shaping plug-ins. Many users of Array appreciate being able to take their music to pretty complex extremes via the apparently modest set of controls. Many also appreciate the tight and efficient workflow that the plug-in encourages, citing its ease of use in creating even the wildest sequences. Sinevibes Array would be a pretty good deal even if it cost a few hundred dollars more than it does. As it is, the price is almost too good to believe considering all the features that you get in return. Equally capable of subtle modulations and extreme glitching, it is the perfect antidote to bland and boring musical parts. “Advanced audio level shaping” is the claim to fame of Sinevibes Inertia, and it certainly does that job admirably. Up to 32 envelope generators can be triggered in time with your host’s tempo, each with its own set of envelope shapes. If rhythmic tremolo and intricate gating and stuttering effects are your thing, Inertia definitely delivers the goods. Sinevibes Inertia has won praise for its wide range of modulation capabilities, which make everything from rhythmic tremolo to hard gating possible. Many users feel that the plug-in’s simplicity is especially impressive given the wide range of features available. This is due in part to the color-coding and subtle animations that make it easy to see exactly what the plug-in is doing to the audio. 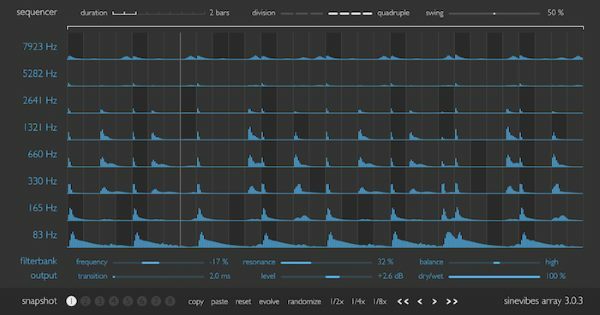 Inertia is quite an impressive sequencer plug-in that does so much more than you would initially expect. Rhythmic tremolo seems to be its main area of specialization, although it can easily switch character and crank out a plethora of chopped and stuttered riffs. The plug-in is further enhanced by the live audio waveform and real-time visual feedback that lets you know how your audio is being sliced and diced. To refer to Sugar Bytes Consequence simply as an arpeggiator would be selling it short. Although it does a bang-up job of performing standard arpeggiator duties, you’ll find that it’s capable of more sound-shaping and mangling tasks that what you expect. The chord sequencer is especially noteworthy as it’s largely responsible for generating the broad pallet of sounds possible with the plug-in. Sound designers will especially appreciate the depth of the modulation section, which provides powerful pattern-based control over the synth engine, as well as the filter and effects. Some of the features that user love about the Sugar Bytes Consequence are the step sequencer that can be set to as long as 32 steps, the control over sequence duration, timing, and swing, and the snapshots that allow for quick recall and creative ‘scene switching’. The availability of nineteen effects processors also makes it a popular choice among sound designers. 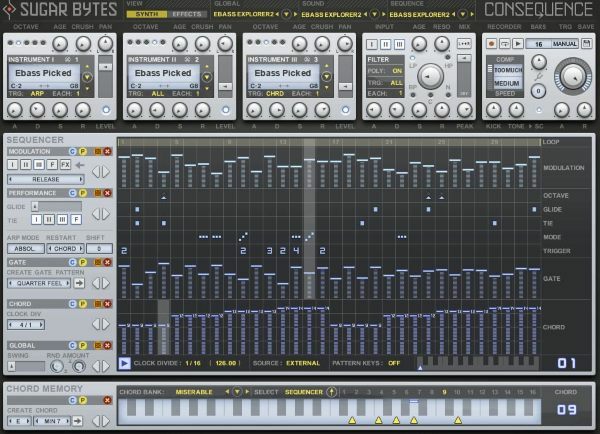 Sugar Bytes Consequence will find plenty of use as an inspiring and creativity-inducing production and songwriting tool. It’s pretty encouraging, taking your music to unexplored territories, it almost seems to force you into adopting a more creative and wildly-experimental approach to creating music. And for the price, that is definitely a good thing. Sinevibes Sequential is a dynamic multi-effect module that continues on where other sequencer plug-ins leave off…. And continue on it does, talk about a host of sound processing and synthesis algorithms that transform your audio into numerous rhythmic iterations. 19 specialized effects that filter, distort, gate, and shape your audio in various ways, this is an essential tool for sound designers, groove merchants and beat makers alike. 14 effects processors, including filter, phaser, wave transformer, sample rate and bit depth reduction, analog drive, ring modulator, and more. Some of the more avid users of Sequential praise its ability to make a wide variety of glitch sounds out of most any audio material. They cite its value as an idea generation tool, many users have good things to say about the randomization feature, which frequently comes up with interesting and usable results. Still other users report using the plug-in to “glitch up” tracks and bring new life to tired old loops. Like all the other Sinevibes plug-ins, Sequential packs a whole lot of functionality and tasty sound-altering capabilities in an intuitive and easy to use package. From its effects section to the 32-step sequencer and useful chordmaker, it’s a good bang for the buck. Considering that every plug-in in this roundup is endowed with so many excellent features, it was pretty difficult to choose the one that deserves the top slot. All things considered however, Sugar Bytes Thesys deserves special mention for the ability to shape the sound in so many weird and wonderful ways, while still remaining remarkably easy-to-use. For sheer power, flexibility, and intuitiveness, Thesys is a pretty tough act to follow. But follow they do, and the company’s own Consequence provides some stiff competition to Thesys. With five sequencers pushing and prodding the audio in wonderfully freaky ways, Consequence also has a startlingly deep modulation section and a fully-stocked sound library that further add to its appeal. The cheapest plug-ins in this lineup are Sinevibes’ Inertia and Array, but don’t think that they are anything less than fully capable. These two are every bit as effective at cranking out unique grooves and pulsating rhythms as the best of them, and only their price sets them apart from the other costlier options. In fact, you might add Sinevibes’ own Sequential to the mix, and have yourself a trio of highly-effective and totally inspiring sequencer plug-ins that provide excellent value for the money.